One of the privileges of being in Shared Future is the wonderful people, and wonderful places it gives you access to. Like the recent Citizen Participation University in Hungary. 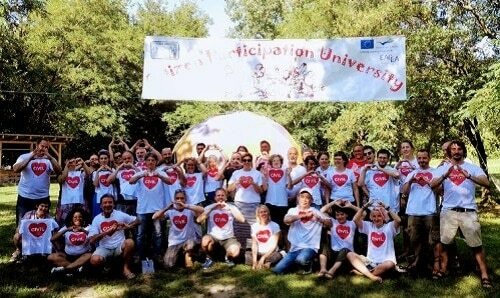 Now in its 9th year, the Citizen Participation University (CPU) is an annual gathering of community activists, organisers and developers, from across Europe, but also reaching out to the USA and into Turkey. 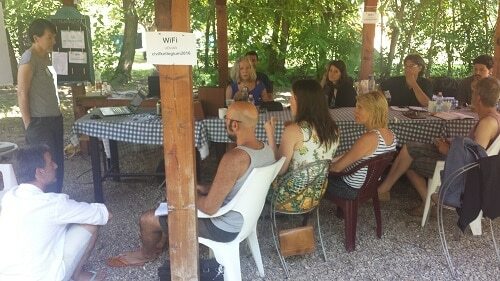 Over 50 people came together, for 4 days, to talk, act out and share their best practice. A real powerhouse of community inspiration, and a rare opportunity to think outside of our boxes. 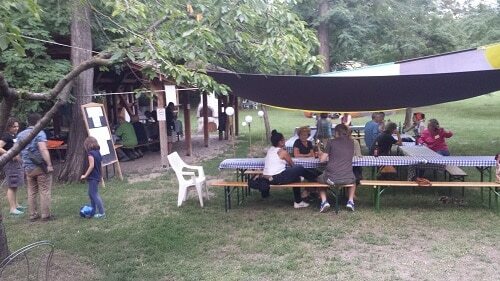 Taking place in the relaxed Civil College, deep in the rural Hungarian countryside. I attended on behalf of Shared Future, following the participation, last year, of my fellow director Pete Bryant. Principally I was going for a holiday, a chance to recharge my batteries. I got that. And also to share some of our learning and experiences of developing participatory budgeting (PB). 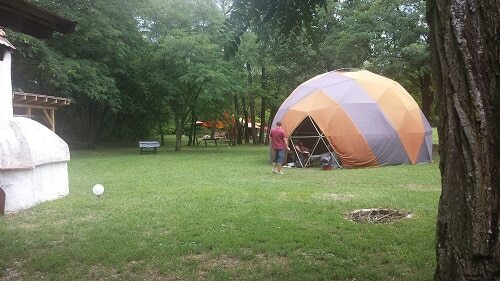 I really enjoyed delivering my workshop in a geodesic dome tent. Where we explored issues of power, citizen budgets and democracy. A mixed and committed audience, and the innovative surroundings drew out the best in all of us. We played games, drew pictures, watched videos, and spent 4m euro of the public funds of the mythical city of Kunbábony. Actually Kunbábony exists, but we reinvented the small village where CPU took place into a modern, messy pan-European community. One wrestling with issues of urban, suburban and rural development, migration, social exclusion, media manipulation and corrupt practices. In two hours we really got deep into what it would take for PB, a form of truly democratic participation to move from the margin into the mainstream. Able to draw out ideas from the community, and engage more and more marginalised people. Whether they were ‘activist annie’, ‘builder bob’ or ‘system siegfried’, or a host of other characters we developed in our role-play. We had a great time. But enough about my workshop. from the UK PB network website. Besides my small gift to the group, I had a huge variety of inspirational workshops to engage with. Too many to list here, but needless to say there was something for everyone. Whether it was action, art or ideas. Community empowerment, creativity or conflict resolution. Recycling food, saving lives or simply juggling interests. As ever it was in the less formal exchanges, the open space discussions and the sharing of food that learning, and relationships, really happened. Any clouds to spoil this idyll? Yes, though not from mother nature. The weather was warm, and the sun shone. But for me personally, there was a toxic undercurrent. The issue, dare I mention it, of ‘Brexit’ crystallised much of it. There are shadowy cultural and political divides going up between my own country and the wider European networks represented at CPU. The confusion and doubt, that some of our worst UK politicians have sown, and the lack of a constructive response from European political leaders has to be acknowledged. The negative insularity of powerful, privileged and hateful people, like UKIP leader, Nigel Farage, who takes delight in insulting Europeans, or anyone in fact, disheartened me and angered others. And provoked a telling insult I didn’t expect to hear at CPU. That maybe it would be better if ‘a tsunami sank England’ once and for all. Brexit (a hateful word that sounds like broken glass) will affect negatively the future of so many in the UK. And it feeds a nourishing poison to another beast always nearby. Let’s not forget that over 10 million French voters supported Le Pen. In comparison there were 17 million UK voters voted for Brexit. That is just over a quarter of the total population of the UK. Too many… and probably half that did vote Brexit didn’t vote against Europe. They voted against their own political leaders, against a neo-liberal austerity, and a perceived threat to their culture from global migration. Issues that have less to do with their European identity and more about internal politics and their local economic realities. Brexit was mostly about the UK, and not about Europe. That still leaves a huge majority, in both the UK and France, rejecting such negative ideas. But if they are living within the UK, by accident of birth, or by migration, arguably they have no voice within discourses about Brexit that are happening within Europe. Particularly the young, like my own children. Now young adults, who really want to be part of the European integration story, and now, fearfully, maybe, cannot become true Europeans. This individual injustice has, to some extent, and with bitter irony, brought other Europeans closer together. Or, at least, united the massively bureaucratic machine that sits at the heart of the wider European political project. Our humiliation has made stronger a neo-liberal, corporatist, single market focused, Northern European dominated ‘EU’. Arguably, at the cost of weaker members of Europe, like Greece or Hungary. Maybe even Ireland, that sits fearfully isolated on the other side of the sea, geographically isolated from both Europe and Britain. Brexit was a reaction against distant political structures and a sense of individual powerlessness. Like a great big rock thrown into already stormy waters. The ripples of which may halt the integration of Turkey. Sunder NATO. Tighten further the borders of Italy and Greece to refugees. The uncertainty of how Europeans go about building bridges, and not walls, that was there too at CPU, because our future seems beset by so many challenges. Fortress Europe, fortress UK, fortress USA, fortress Russia. Fortresses everywhere. Solid as a rock, or brittle and unfriendly as broken glass? It leaked over into my responses, and some of the responses I got in return, such as the tsunami described above. Like a poison infecting the body politic, and trickling down into the politics of the person. They are inevitably linked. Coming through again and again in our CPU debates about nationalism, or cultural defensiveness in the face of migration. In our acknowledgement of real danger within the state of Hungary, or when discussing political violence in Turkey. In Norway, post Breivik’s massacre of the innocents. Of the cold hateful USA of Donald Trump. Or the 10m French voters for Le Pen. Many of my civil society colleagues from Eastern Europe bear the unending burden of the refugee crisis, a lack of acceptance of the Roma community, and unending manipulation of political narratives by right wing media. The same patterns exist everywhere, and the beast of fascism really is rearing its ugly head. Everywhere. CPU couldn’t solve these problems. But it did provide much needed space to air them, constructively, peacefully, and with hope for a better world. Europe needs to change, and change is coming regardless. The challenges ahead are immense. Without opportunities to learn, and to come together, they will overcome us. So think global, and act local. Think about hope, and think about ‘people’ as more than ‘a people’. Political identities might not bring us together, but sharing does. And that is what we did at CPU this summer. Thank you all.